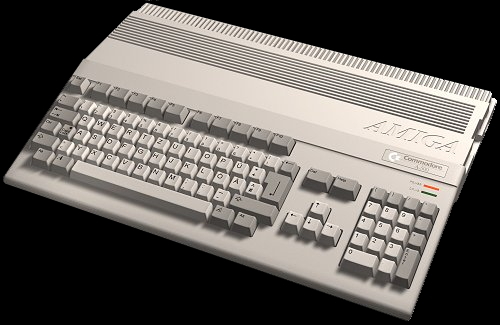 Around the time of NES and the arcade, the Amiga 500 entered my life. The arcade stood for awesome graphics and quality but was limited to it's typical arcade genre of games. The Amiga had amazing innovation of gameplay in combination with awesome powerful hardware considering it's time. NES could not compete with any of this, yet the Amiga never became that very big in the US as it was in Scandinavia. 32 on screen, Palette of 4096 53 fixed colors, 25 each scanline4. After the total letdown of the Atari 600XL, I wanted to buy a machine that was really good and nothing second hand. So instead of buying a C64, I waited and bought an Amiga, even though I knew absolutely nothing about it. The only thing I've heard was that some kid had bought a computer which was much better than a C64 and that made me go to a shop and buy the only thing I thought it might be. When I came home and for the first time inserted a disk in the floppy drive, I became really scared as the drive roared like a lion and gnarled like an angry pig. I thought I'd made a huge mistake like put the disk upside down but it was supposed to sound like that. I was 12 years old and knew very little English. This was my road towards learning even if I wanted to or not. I remember having bought "Bards Tale" and it said "Insert Save Game Disk". As I had only gotten 1 disk with the game, I put that one into the drive. Then it said: "Disk is not formated. Do you want to format? Yes/No. As the game did not start up when I pushed no, I felt that the only option left was to push yes. After that experience I got a bit better understanding about what a formated disk was. What a supercomputer the Amiga really was. The graphics was awesome, the sound was awesome and best of all, the games were totally awesome! It felt like no end to the game developers imagination. So very many new kind of games appeared that was nothing like the games I played before. I meant to write a small list, but that was not really possible with all the great games on the Amiga. 1. The Amiga has a custom chipset consisting of several coprocessors, which handle audio, video and direct memory access independently of CPU. This architecture freed up the Amiga's processor (a 7.09Mhz Motorola 68000) for other tasks. 2. It's CPU was an 8bit 1.66MHz Ricoh 2A07. The NTSC version had a clock speed of 1.79 MHz. 3. PAL mode: 320×256, 640×256, 640×512 (interlace), 704×576 in overscan. 320x256 was the common resolution for games. 4. Background: 4 Palettes x 3 Colors + 1 Back Color. Sprites: 4 Palettes x 3 Colors. 5. 64 sprites, 8 sprites per scanline. 8x16 pixels per sprite. 8x8 tiled background. 7. 4 hardware-mixed channels of 8-bit sound at up to 28 kHz. 9. Based on 1987 Roger Damon/Interstel Atari ST release. Amiga coding by Doug Gerecht & Tim Linstrom. 10. Released on the C64 1986, the game got a beautiful remake for it's conversion to the Amiga. 11. Originally released on the Atari ST which had the better version with a full set of alien language sounds. Noted here due to the lack of an Atari ST section and the games very original style and gameplay. 12. Originally programmed for and on a C64. 13. Originally programmed for and on a C64 even though the Amiga version was finished earlier. 14. Prequel to "Best Of The Best: Championship Karate" alias "Panza Kick Boxing 2"
15. Released for the PC 1990.